The QNX Aviage Acoustic Processing Suite is a modular library of field-proven algorithms that improves the clarity, quality, and accuracy of voice communications for hands-free and speech recognition systems. Suited to diverse communication environments (including automotive, conference telephony, telepresence and VOIP), it allows customers to build a high-quality, resilient audio solution without expensive and time-consuming tuning for differing solutions within each environment. The QNX Aviage Acoustic Processing Suite contains modules on both the receive- and send-side that are designed specifically for clear and accurate sound delivery. They handle acoustic echo cancellation, noise reduction, wind blocking, dynamic parametric equalization, bandwidth extension, and more. Together these modules guarantee the finest possible quality communication — even in the challenging environment of a moving vehicle or crowded conference room. The QNX Aviage Acoustic Processing Suite offers lower production costs, easy customization and integration, and faster time to market. The QNX Acoustic Processing Suite eliminates the need for an additional, dedicated processor (DSP) for acoustic processing. This fact alone can generate savings of up to $15 per unit in Bill of Materials costs. The QNX Aviage Acoustic Processing Suite can run on the general purpose processor, saving the cost of the DSP. The QNX Acoustic Processing Suite can offer these savings while delivering the high-quality, full-duplex hands free communication required today because it is a single library designed to co-exist with other applications on a general purpose processor or DSP. This library integrates easily and efficiently with the main CPU or DSP of a vehicle’s speech, telematics or radio module. Designed for use on multiple platforms and for easy upgrades, the QNX Aviage Acoustic Processing Suite can be reused as is, or easily customized across different product lines with minimal new development investment. The QNX Aviage Acoustic Processing Suite speeds project development. Its modular architecture makes it easy to add, remove, customize and debug both receive-side and send-side processing steps. Pre-testing ensures compliance to standards such as VDA (Verband der Automobilindustrie) and removes unknowns and variables that slow project development and drive up costs, while an Advanced Diagnostics module helps developers quickly identify and eliminate problems. The QNX Aviage Acoustic Processing Suite is modular, so projects can implement all the functionality they need, but only the functionality they need. The QNX Aviage Acoustic Processing Suite is designed and engineered to address the challenges of unforgiving acoustic environments. It provides the most sophisticated and flexible acoustic pre-processing solution available today. 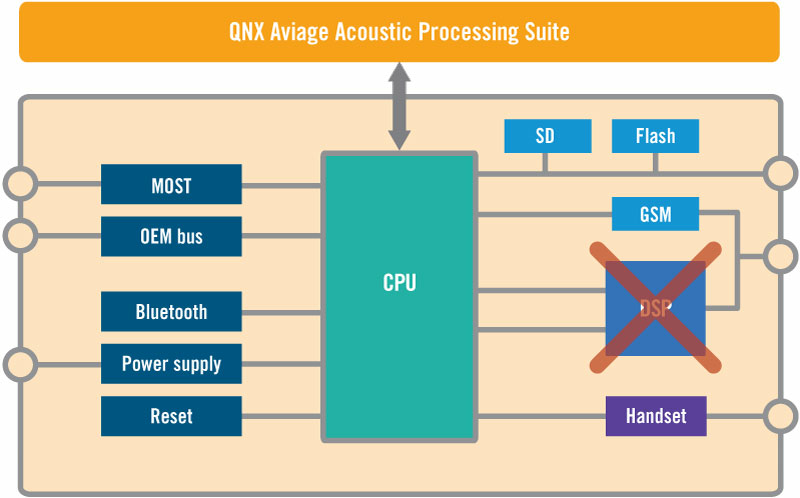 QNX Aviage Acoustic Processing has many selectable modules for send and receive-side processing. The QNX Aviage Acoustic Processing Suite is designed to enhance hands-free communication for the driver and the co-driver in an automobile, as well as for participants on the receive end of a conversation. The sophistication of the QNX Aviage Acoustic Processing Suite comes from its high-quality, scalable software library of algorithms. This library is structured as pre-defined modules that can be configured based on application requirements, specific cabin conditions, and the level of voice enhancement required. The library and modules can be initialized and applied to deliver excellent performance without any vehicle-specific tuning, or customized by developers to meet specific performance levels for designated environments. The QNX Aviage Acoustic Processing Suite undergoes comprehensive testing, which ensures compliance to VDA, and upcoming JTU-T standards, and delivery of the best possible quality end-products, as well as reduced project risks. The QNX Aviage Acoustic Processing Suite send-side modules improve the audio signal captured by microphones in the vehicle in order to improve the quality of the signal received — and thus the audio — at the far-end. The acoustic echo cancellation (AEC) module reduces echo during hands-free calls by removing feedback generated by in-cabin speakers. It's algorithm is adapted to handle small and large cabin sizes, as well as automatically adjust for audio path delay. The dual-channel mixer and post filter (CMIX) use information from two microphones to improve the speech components of a send signal, far more efficiently and effectively than multiple-microphone beam-forming solutions. The post filter provides spatial noise reduction by reducing uncorrelated noise picked up by the two microphones. This module delivers optimal send-side speech quality for diverse microphone array designs. Tested with a wide range of array designs in different vehicles, with “worst-case” scenarios where microphones are shorted, this module offers the system designer greater flexibility in handling multiple customer microphone requirements than is possible with beam-former solutions. The off axis rejection (OAR) module provides the ability to improve voice recognition performance in a multi-microphone environment. OAR module switches between the driver and co-driver depending on who is speaking and works to eliminate any other in-car noise or overlapping passenger speech. OAR is similar in concept to a beam-forming microphone although it is adaptable and uses less CPU horsepower. The high frequency encoding (HFE) module compresses high frequency sounds into lower frequency sounds so that consonants (notably fricatives such as ‘s’ and ‘f’) transmit with improved intelligibility, but are still transmitted through cellular network codecs. This frequency encoding renders the telephone-transmitted voice both more natural and intelligible at the far-end. The noise reduction (NR) and speech enhancement module reduces the impact of additive and dynamic noise, such as road noise. It preserves the natural quality, continuity, and flow of speech by removing unwanted noise and distortion, and enhancing the speech portion of the signal. The module includes dual microphone mixer support. New improvements to noise reduction provide for up to 20dB of noise removal without impacting speech. The dynamic noise reduction (DNR) module performs additional noise removal at lower frequencies. This helps minimize gating issues that can occur with CDMA phones. It also allows network voice codecs to properly detect pitch in noisy situations, without which voices can sound hoarse or unnatural. Additional features include tonal noise reduction, which detects and removes repetitive frequencies from the audio caused by grooved pavement, concrete separation strips, or engine noise. The low frequency reconstruction (LFR) module uses speech information present in the mid-frquency range to reconstruct speech frequencies masked by low frequency noise. Noise removal techniques remove the offending audio and LFR module adds back in the missing harmonics, resulting in more natural, fuller sounding speech. The wind buffet (WB) removal module identifies and eliminates the acoustical impact of wind flow from open windows, defrosters, drop-top convertibles, or building HVAC operations. The equalization module controls the sound quality of the send portion of a hands-free conversation, using a parametric equalizer that supports both static (PEQ) and dynamic equalization (DPEQ). For DPEQ, the user can specify two static equalization curves; based on the signal-to-noise ratio at the microphone, the resulting equalization will be a smooth blend of both curves. The dynamics module includes a smart automatic gain control (AGC) mechanism that increases or decreases gain of the signal, based on voice (not transient noises). It can do so independently for different sub bands so that voice is adjusted up and noise is adjusted down. The far end receives consistent volume level, increased perceived loudness and intelligibility, and reduced clipping. The soft limiter (LIM) prevents speech distortion caused by large peaks in speech. The QNX Aviage Acoustic Processing Suite receive-side improve the quality of the received signal to offer constantly high-quality near-end audio, reducing the need for user interaction with system controls and presenting, not only a better communications experience, but also, in automotive environments, reducing driver distraction and improving safety. The electrical noise suppresion module detects and suppresses noise between speech segments, such as from some NAD (network access device) chips. The bandwidth extension module extends the narrow-band hands-free signal frequency range to deliver warm, natural and intelligible speechhelps deliver warm, bright and natural speech to the in-vehicle user. It achieves a qualitative improvement in received speech quality thanks to a unique, patented technology that extends received signals beyond the narrow-band frequency range of 300 Hz to 3400 Hz used for hands-free telephone speech signals to the better approximate the full 60 Hz to 10 kHz range of natural human speech. The dynamics module includes a smart automatic gain control (AGC) mechanism that increases or decreases gain of the signal, based on voice (not transient noises). The far end receives consistent volume level, increased perceived loudness and intelligibility, and reduced clipping. The soft limiter (LIM) prevents speech distortion caused by large peaks in speech. The dynamic level control module improves intelligibility in the presence of noise by allowing near end to hear speech at the same loudness across noise conditions. The acoustic echo cancellation module reduces echo during hands-free calls by removing feedback generated by in-cabin speakers. → Permits turning on and off of features such as NR, AEC, RES, PEQ and AGC. → Views and changes parameters, such as EQ curves. → Records audio at various tap points to file. → Logs events as WAV file markers. → Saves and loads configurations. → Runs diagnostics with the Advanced Diagnostics module. 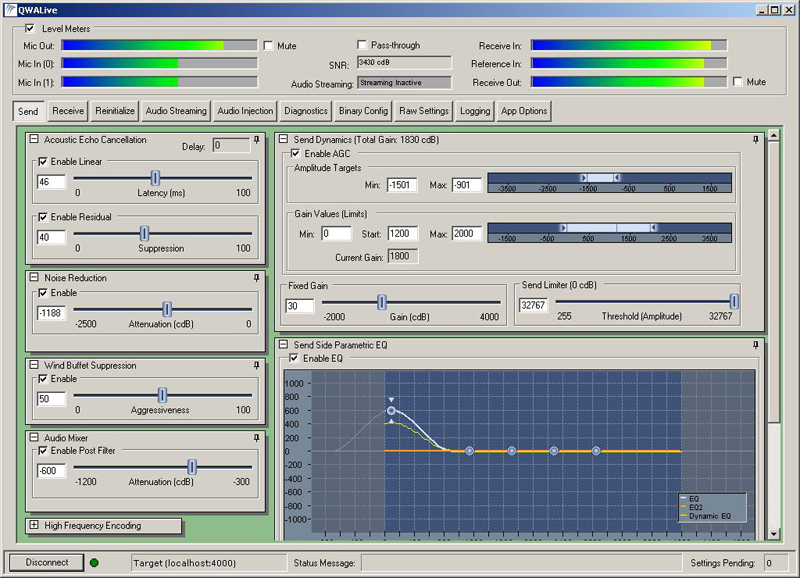 The QNX Aviage Acoustic Processing Suite’s advanced diagnostics module supports automatic latency calibration, test waveform generation, coherence and distortion measurements, dynamic latency tests, amplifier dynamics checks, coupling measurements, and static and dynamic impulse response measurements. 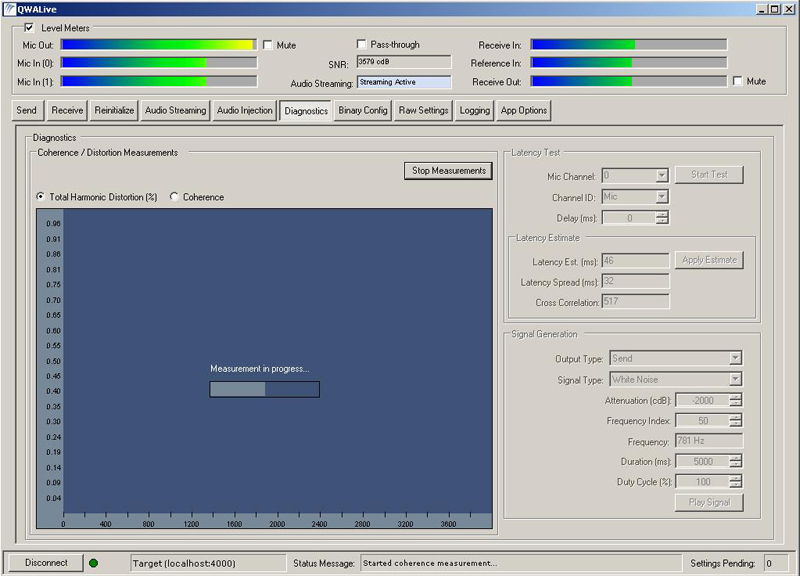 For example, a file-based test application, which measures echo cancellation performance in the context of VDA specifications, isolates the echo cancellation software from the system as a whole to predict release performance ahead of production testing. Available as C-callable, stand-alone library. QNX SDP 6.4.0, or more recent. Versions for other operating systems, such as Microsoft WinCE, Linux, or µITRON are available for selected architectures. Please contact your QNX sales person for more information. Dependent on choice of sample rate and frame shift.